Heya everyone, sorry I haven't posted anything in quite some time. I was overseas in Germany for vacation during my summer vacation. I had a friend watching my tank while I was gone, pretty much just feeding my fish and keeping the water in check as she doesn't know much about aquariums. She told me that my tank had some algae on the walls, but holy cow!! It was so thick I had to scrape at it with a razorblade for nearly an hour, haha! The good news is after a water test all that was wrong was my calcium was pretty low, and my PH was a bit high, but after a long over due water change and some doses of calcium plus everything is back to normal! Here's a few pictures, sorry for the quality but they were taken from my iPhone.. Some unfortunate news though, a few days after I took these pictures I heard a problem with my return pumps, like there wasn't enough water in the tank. It was about 3:00 am and I was just about to go to bed when it started. I checked the back and there was what looked like a very large bubble coming in from the overflow. A few seconds later I realized it was my anemone. Somehow it managed to get it's "foot" through one of the little slots of the overflow, while the other half of it's body through another slot. I tried for hours to get him out of there, but unfortunately I could not think of anything to do. Let me remind you during this time I could not turn on my pumps because the anemone was taking up the entire overflow and nearly caused the aquarium to overflow onto my floor. 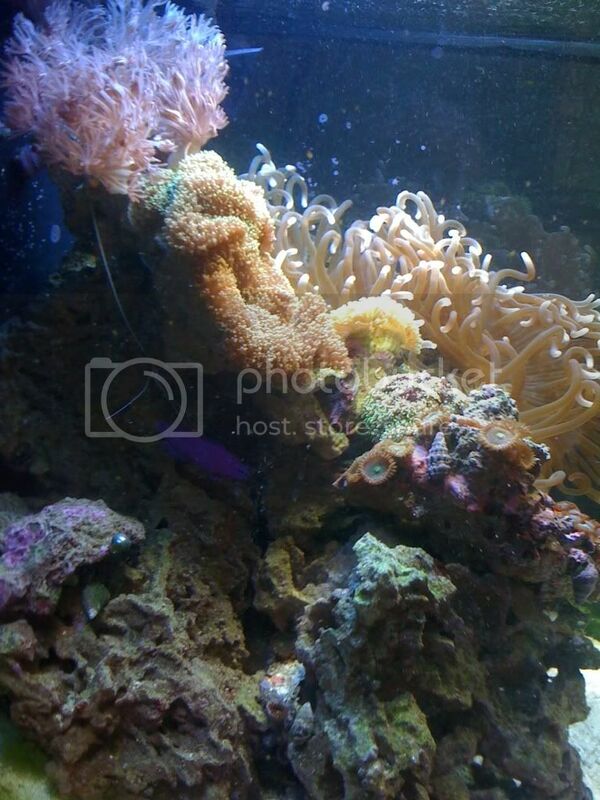 So, unfortunately, the anemone is no longer in my tank and my clownfish swims around all sad looking. 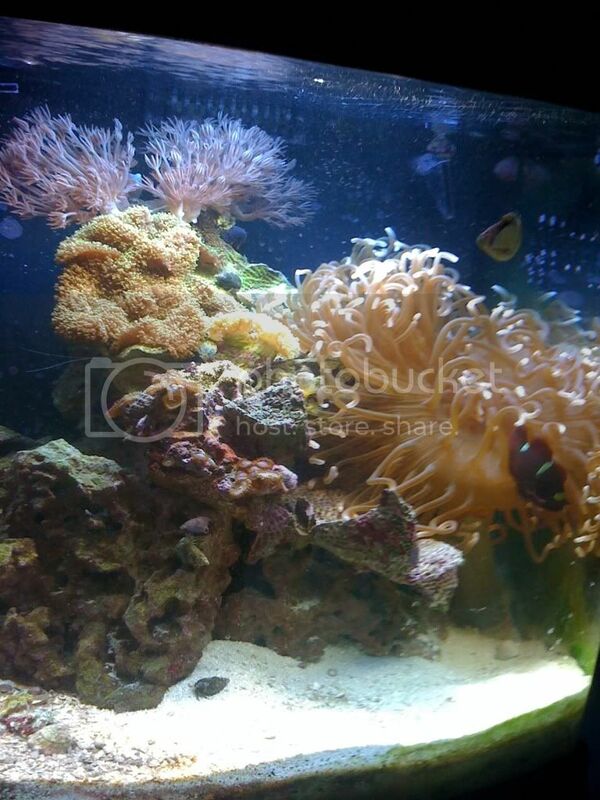 I put in a sebae anemone today, but my clown hasn't gone in it. Hopefully it will, but if not, it's still a very pretty anemone. 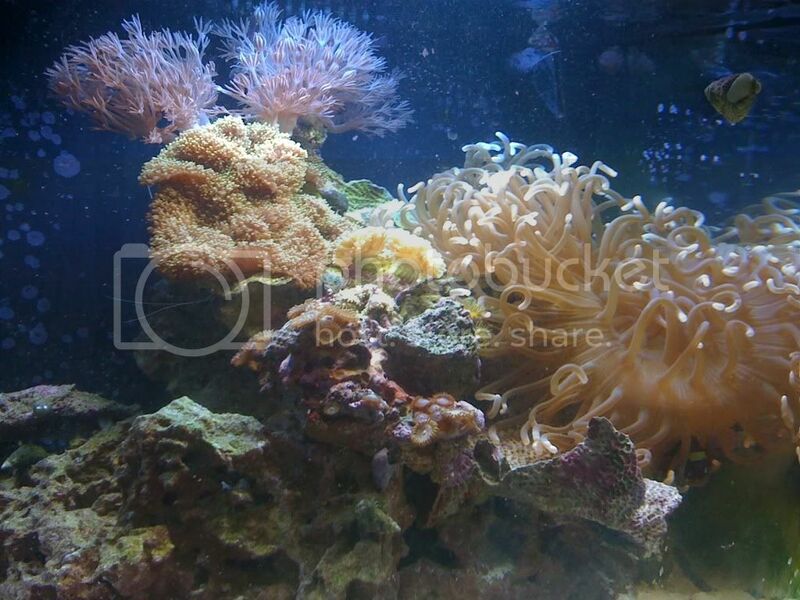 Sorry to hear about the anemone, the pics look good. Nice purple pseudochromis.